In 1984, NASA scientist Mathew Schwaller floated the idea of using Landsat 5 to monitor Adélie penguin populations in Antarctica. His idea was simple: since these sea ice-dependent penguins nest in large, densely packed colonies in the same place each year, they leave behind guano stains on rocks. Schwaller thought the stains might be big enough for satellites to detect, thereby adding a new way to estimate penguin populations. More than 30 years and several published papers later, it is clear that Schwaller was on to something. 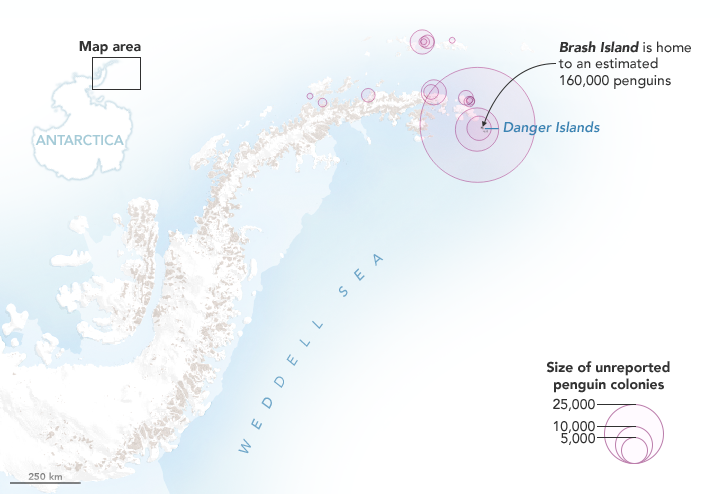 Not only have scientists used Landsat to find dozens of previously unknown colonies, they have become adept at using satellites to assess and track penguin populations over time. Coupled with finer-resolution commercial satellite imagery and with information collected during field expeditions, data from Landsat now feeds into an online database designed to make it easy to learn how populations are faring across Antarctica. Some of the biggest colonies Schwaller and colleague Heather Lynch of Stony Brook University have discovered with Landsat are in the Danger Islands. 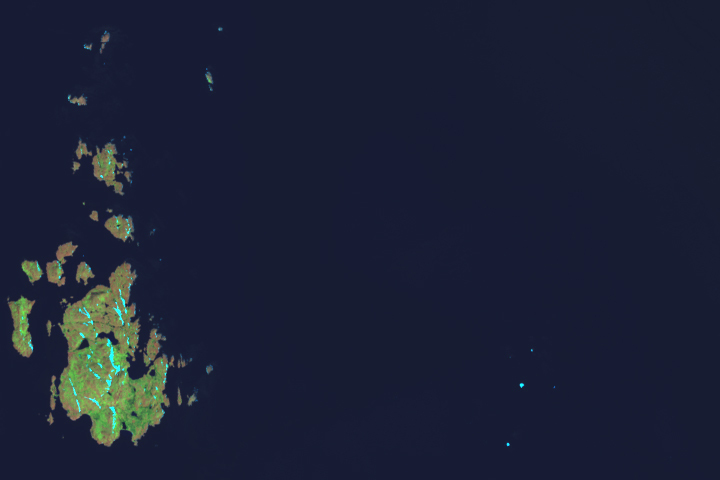 Many of these remote, tiny islands off the northern tip of the Antarctic Peninsula have rarely (or never) been surveyed because sea ice cover makes them difficult to visit. 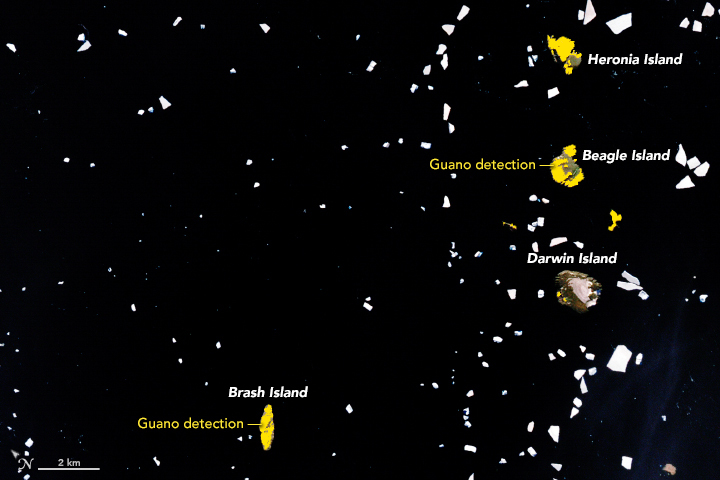 By using an automated technique that keys in on penguin guano, Lynch and Schwaller used Landsat 7 images to identify roughly 166,000 penguins on Brash Island, 23,000 on Earle Island, and 7,000 on Darwin Island that were not previously accounted for. 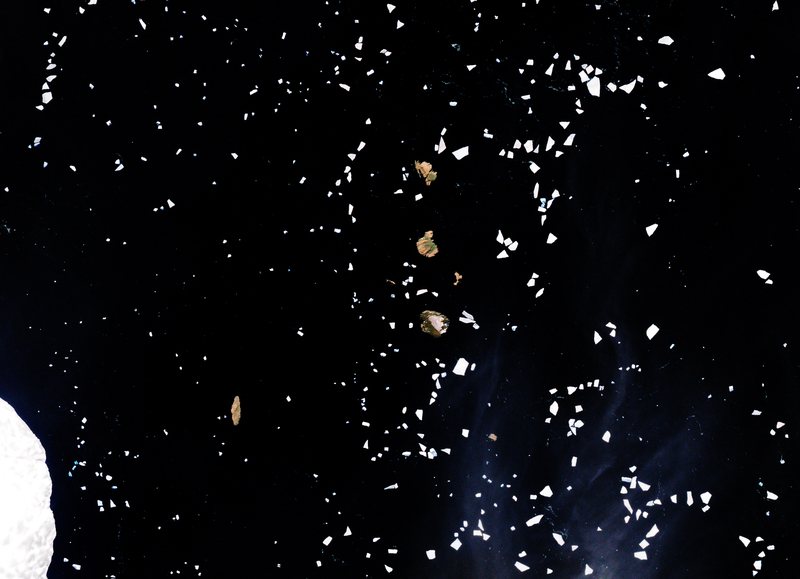 In the Landsat 7 image above, areas with guano stains have a pinker color than exposed rock without guano. The retrieval algorithm developed by Schwaller works by sampling the colors of rocks at known penguin colonies and then flagging the same colors in parts of Antarctica where research teams have never set foot. 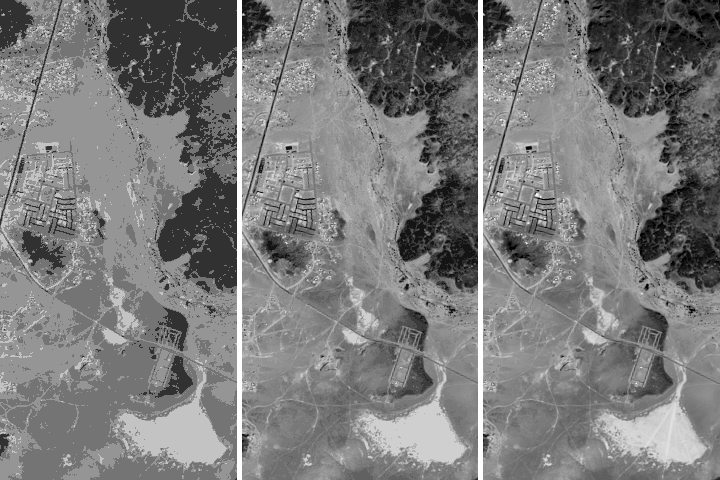 In the pair of images above, compare the natural-color image (top) with an image with guano stains outlined in yellow (bottom) by the algorithm. Adélies are primarily responsible for the stains, though there may be some Chinstrap and Gentoo penguins mixed in as well. 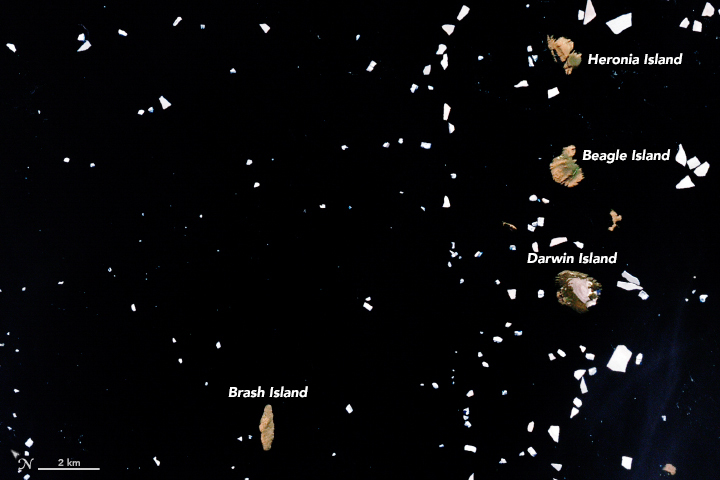 Adélies need exposed, relatively flat rock to nest, which probably explains why the stains on the jagged landscape of Darwin Island are smaller than others. The map below shows other locations along the Antarctic Peninsula where Schwaller and Lynch detected previously unreported colonies. 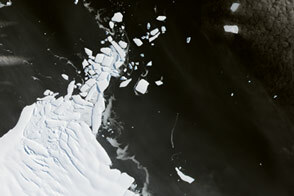 Since the size of each pixel in a Landsat image is equivalent to a 30 meter by 30 meter square, Schwaller’s technique does not always detect small penguin colonies. 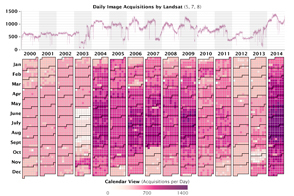 By comparing the Landsat algorithm results with field observation and with finer-resolution imagery from commercial satellites (often 1 meter by 1 meter squares), the scientists determined that they could detect colonies with fewer than 3,000 breeding pairs about half the time. They always correctly identified colonies with at least 10,000 breeding pairs. Most penguins live in large colonies, so the algorithm detects 97 percent of penguins. Since Adélie penguins cannot survive without sea ice, many observers see them as a sensitive species that could face rapid population changes if Antarctic sea ice retreats because of climate change. A recent satellite-based census of Adélies found that populations have decreased near the Antarctic Peninsula but have increased in East Antarctica. The Antarctic Peninsula lost a good deal of ice over the past three decades, while the opposite happened in East Antarctica. 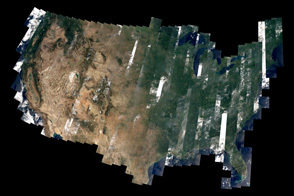 NASA Earth Observatory images by Joshua Stevens, using Landsat data from the U.S. Geological Survey and calculations from Lynch, H. J., & Schwaller, M. R. (2014). Story by Adam Voiland. How scientists are discovering colonies in remote parts of Antarctica by searching satellite images for guano stains. Lynch, H. & LaRue, M. (2014) First global census of the Adélie Penguin. The Auk, 131 (4), 457-466. Lynch, H. & Schwaller, H. (2014) Mapping the Abundance and Distribution of Adélie Penguins Using Landsat-7: First Steps towards an Integrated Multi-Sensor Pipeline for Tracking Populations at the Continental Scale. PLOS. MAPPPD (2017) Mapping Application for Penguin Populations and Projected Dynamics. Accessed June 7, 2017. Schwaller M. et al. 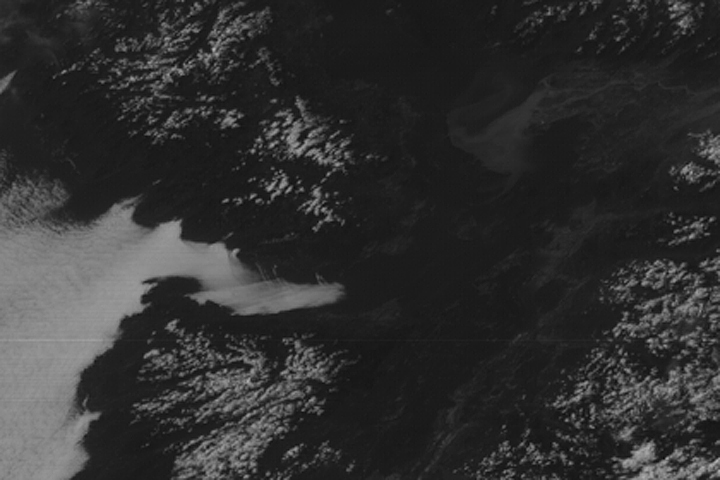 (1984) Prospects for satellite remote-sensing of Adélie penguin rookeries. International Journal of Remote Sensing 5, 849-853. Schwaller M. et al. (2013) Continental-scale mapping of Adélie penguin colonies from Landsat imagery. 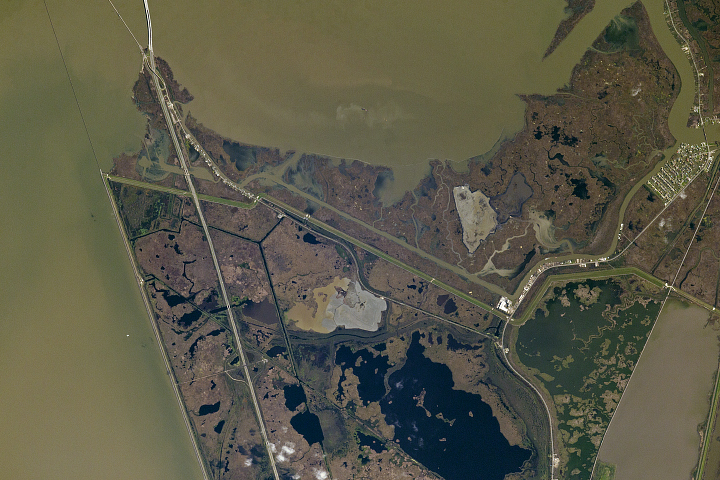 Remote Sensing of the Environment, 139, 353-364.